exacqVision has integrated with Commend intercom systems for unified audio and video communications. Commend camera equipped call stations and add-on camera modules support exacqVision video management systems (VMS) software. This integration requires exacqVision 7.8 or later and Commend software package version PRO2.1 or higher, Commend CCT800 utility 5.0. Learn more about the Commend integration. If you have questions, contact your local sales representative. Exacq received Lenel factory certification with OnGuard version 7.1 and 7.2 access control system. This integration provides users with an easy-to-use, versatile access control and video surveillance security system through one platform. 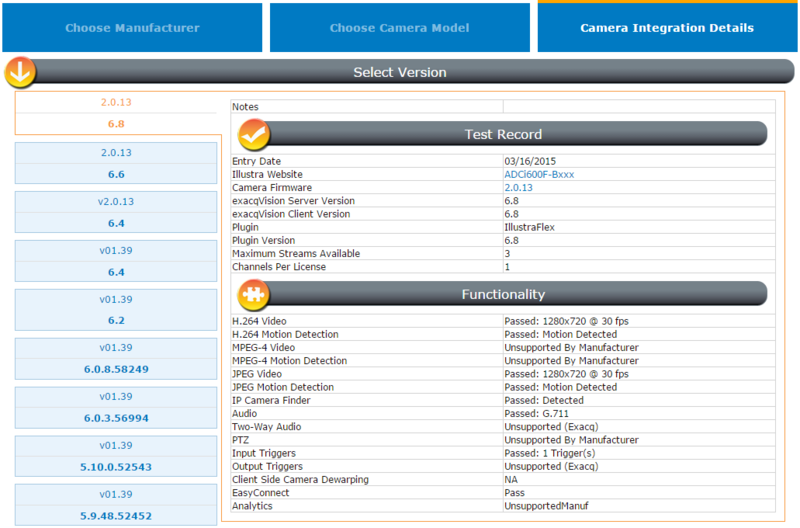 exacqVision version 7.4 or later with a current exacqVision Enterprise license and OnGuard 7.1 or 7.2 are required. Download the plug-in now. Previous certifications of earlier versions of OnGuard are also available. Exacq announces a new integration with Inex/Zamir license plate recognition software. This integration gives exacqVision users greater video surveillance capabilities within one interface. This integration requires exacqVision 7.2 or later and IZServer build 73 or later. Learn more about this integration on our partners page. As this year comes to a close, we look back at 2015 and many new innovative features released in exacqVision video management system (VMS) software. 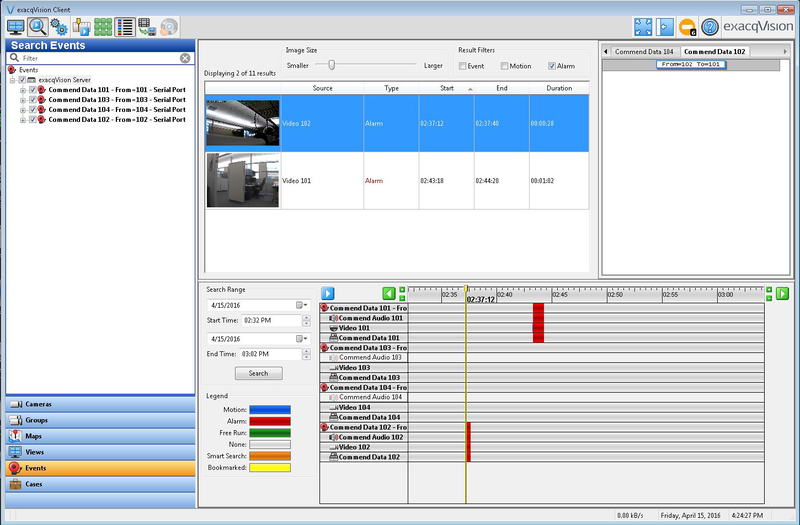 Introduced in exacqVision 7.0, CameraLinks allow users to configure overlay controls that will display when hovering over a camera in live view. exacqVision Professional and Enterprise users now have the most important commands at their fingertips. CameraLinks improves response time to critical alarms and events. Integrated with Kantech EntraPass and DSC PowerSeries Neo intrusion system, exacqVision users can operate their video, access control and intrusion from the live view page of the exacqVision client. 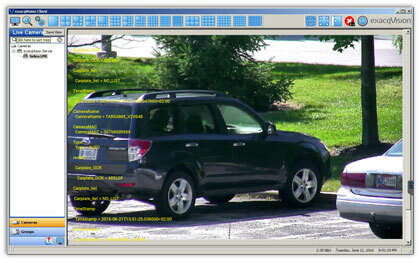 CameraLinks enables exacqVision users to control their complete security system from one, easy-to-use interface. The complete security solution reduces complexity for security personnel while saving time and money. Users can complete customize their CameraLinks. Through the camera settings page, the text color, font, style, transparency and location on screen can be adjusted to fit any specific needs. Setup indicators, available in exacqVision 7.2 to Professional and Enterprise users with a current SSA, guide installers through configuration changes that will optimize their exacqVision installation. These indicators are available to power users and admins and provide guidance on configuring motion detection, ensuring network connectivity, changing default passwords and more to ensure no installation steps are missed. By double-clicking an indicator, users are taken directly to the associated page to immediately configure, saving them significant time.In version 7.4, setup indicators expanded to include health indicators. Users receive real-time notifications in the client when camera or recorder health needs addressed. The health indicators maximize system uptime and increase reliability. Exacq launched the new exacqCloud platform for Exacq dealers to easily manage and monitor exacqVision recorders for many end users. exacqCloud decreases dealer response time and lowers costs with proactive notification of health events. With exacqCloud, dealers can continuously monitor critical video recording components like recorder uptime, camera uptime, temperature warnings, recording requirements not met. Exacq certified dealers who have implemented exacqCloud in their business this year have found they have reduced time consuming, expensive diagnostic trips and sent out better prepared technicians faster than ever before.See how one Exacq dealer has benefited from using exacqCloud this year. VideoPush enables exacqVision Enterprise users to instantly push selected cameras, layouts, tours, groups or entire views to a mobile device. Video can be sent and shared directly with officers on patrol or other remotely stationed employees for on-the-go collaboration. If suspicious activity occurs in a specific area, an operator can push the video directly to the mobile device of the person closest to the activity to take immediate action. The Exacq mobile app is available for free download on iOS (Apple), Android, Kindle Fire and Windows Phone 8 devices. What features would you like to see from exacqVision in 2016? We welcome your suggestions and feedback to continue to make the exacqVision client better for your needs. Thank you for selecting exacqVision, and we look forward to continuing to improve our products for you in 2016! exacqVision users can now watch and communicate with people by combining exacqVision’s new cameralinks feature with Axis A8004 network video door station, a new high performance intercom. Fully integrated with exacqVision, this intercom solution provides two-way audio in addition to real-time video at doors requiring manual remote entry control. This solution is most useful to verify identity at remotely controlled doors and gates. Together, Exacq and Axis provide customers with a quicker and easier way to improve security. See the integration details. View a video on how to configure exacqVision Camera Links.